2014-02-15: Installed our LNA4ALL amplifier on the discone antenna, should give a slightly better signal-noise ratio and allow us to split the radio signal out to several receivers so we can capture several kinds of signals at once (e.g. ADSB, AIS and APRS). This project consists of several small sub-projects related to radio reception at RevSpace. Reception is based (so far) on DVB-T dongles using an RTL2832 chip to do SDR (software-defined-radio). To receive signals from the relatively low frequency "HF" band, we have a ham-it-up board. 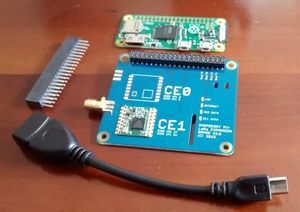 The ham-it-up converts signals from 0-30 MHz up to 125-155 MHz, this makes is possible to use an RTL2832-based dongle to receive them. Right now we are experimenting with receiving HF on the discone: pskreporter makes it easy to plot a map. Experiment with different (home made) antennas such as the mini whip. 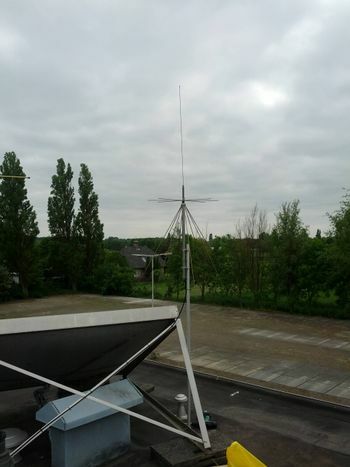 For generic radio reception in the VHF/UHF bands, we have a setup consisting of a discone antenna (ICOM AH-7000) on the roof of RevSpace and an RTL2832 dongle (R820T tuner). A simple filter (1/4 wave open stub) has been built to suppress very strong P2000-pager signals. Supressing the FM broadcast band. The strong signals cause intermodulation (ghosting) and presumably a higher overall noise floor. Listens on SSH port 22 both at v4 and v6! OTG cable with USB-ethernet adapter to connect to the LAN. 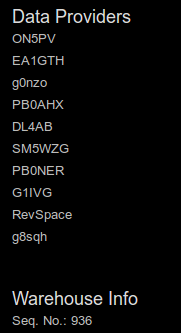 Log in using user 'pi' (guess the password). If all is right, you see an orange and green light on the LoRa shield. You'll see the RSSI change a bit every second in the display of the gateway software. The antenna is not tuned for this frequency. Tuned antenna @ 162 MHz might improve decoding. In this project, we try to receive amateur satellites and process data like telemetry. There are several amateur satellites in orbit right now, some of which transmit in frequency range of our HAB setup. Signals outside of the 70cm band can only be received with the discone antenna. This antenna might not be the best for picking up weak signals. However, since we have line of sight as soon as it's a few degrees above the horizon it should still produce some interesting results. We have already managed to receive (but not decode yet) signals from the STRaND-1 and HOPE-1 (HO-68) satellites. In the future, we plan to receive and decode telemetry from the existing Delfi-C3 and its successor Delfi-n3xt (launched in November 2013). Delfi-n3xt has heard, but not yet decoded. 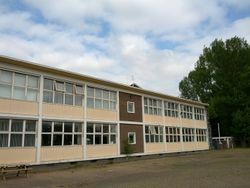 Instead we have been focusing on the FUNcube-1 cubesat. As of editing this page (25 hours since launch) we received 113 packets. You can see up-to-date receiver statistics here. The FUNcube warehouse is the central database where radio enthusiasts all over the world can submit their decoded telemetry data to, so the FUNcube team always knows whats going on. Antenna: Diamond X-50N Apparently not a Diamond, might be a Comet. We'll go with "collinear antenna for 70cm", N connector, three ground plane radials. Power the HABAmp from the the rtl-sdr dongle's USB connection, so we don't need so sacrifice a USB port for it. Coax stub filter for 430.350 MHz (PI2HGL) FM voice repeater. 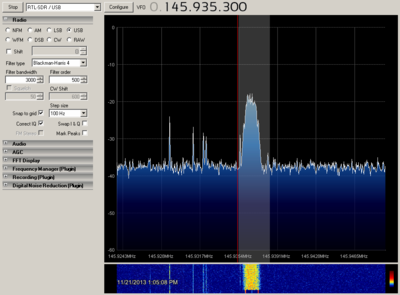 It causes the rtl-sdr to overload when relaying voice. Look at the beautiful stainless steel bolts! This page was last modified on 16 September 2016, at 18:00.